The elephant is the spiritual strength that removes obstacles. 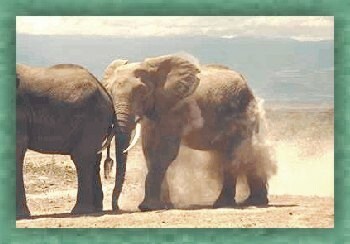 The elephant is Strength, sometimes Strength illumined with Wisdom, sometimes strength removing obstacles. 1. Not to allow the impulse of speech to assert itself too much or say anything without reflection, but to speak always with a conscious control and only what is necessary and helpful. 2. To avoid all debate, dispute or too animated discussion and simply say what has to be said and leave it there. There should also be no insistence that you are right and the others wrong, but what is said should only be thrown in as a contribution to the consideration of the truth of the matter. 3. To keep the tone of speech and the wording very quiet and calm and uninsistent. 4 Not to mind at all if others are heated and dispute, but remain quiet and undisturbed and yourself speak only what can help things to be smooth again. 5. If there is gossip about others and harsh criticism, not to join — for these things are helpful in no way and only lower the consciousness from its higher level. 6. To avoid all that would hurt or wound others.